Buongiorno miei amata amici! Biscotti's root words mean "twice baked" which is befitting for this treat. In Italian biscotti means cookie or biscuit. Thus biscotti is a twice-baked cookie! For it is first baked into a loaf and then sliced diagonally into cookies and rebaked to toast the outside of this delicacy giving it a crisp outside and a texture similar to shortbread inside. In our family, homemade Biscotti is also consumed twice as fast, as store bought versions. Because Biscotti are baked so as to dry them out to prevent mold and they keep well in an airtight container for months at a time, sailors loved them, notably Christopher Columbus. The shelf life is approximately 2-6 months without preservatives, dependent upon your additions and how well they are dried out during baking. Versatility is the chef's friend with biscotti. Your imagination is your limit. Traditionally they were made with butter, eggs, sugar, flour, and almonds. Today, you can find them in many flavors and baking them yourself lends you the key to unique biscotti. Your friends and family will be raving about the best biscotti they have ever enjoyed after savoring your baking. For my amaretto flavored cookies I confess I did not only use a little almond extract flavoring, but I also added my husband's amaretto flavored non-dairy creamer (about a 1/3 cup). I should like to try them with some Italian Amaretto liqueur in the future. Preheat the oven to 350 degrees F or 175 degrees C. Line a cookie sheet with parchment paper for the best result, otherwise lightly grease your cookie sheet. In my Kitchen Aid mixer I creamed together the butter and sugar, then added the flavorings. I then beat in the eggs, baking powder, and salt. I then mixed in the flour until well blended. I divided the dough in half and shaped it into foot long logs on my cookie sheet, pressing each into about a 1/2" thick. This needs not be exact, as biscotti is forgiving. 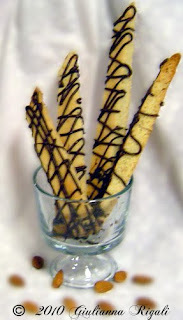 Bake the biscotti for about 30 minutes either on the bottom or center racks of your oven. Remove from oven and cool down enough to work with, but not all the way cool. Using a serrated knife, cut them diagonally into 1/2" thick slices. Gently separate the slices from each other just a tad so the heat can get to all sides of each slice. Place back in oven for another 10-15 minutes to finish the baking, turning slices over about midway. After removing from the oven, let them cool some. I then melted chocolate (can be done either in the microwave or in the top of a double boiler), spooned it into a small Ziploc baggie and snip a very small tip off one corner. Then I squeezed zig-zags across the biscotti in a couple of directions. I did place the cookies in the freezer for a couple of minutes to set the chocolate before storing. In the future, I will share with you a traditional biscotti recipe using olive oil, instead of butter. Let your imagination guide you. One could add sliced almonds to this or crush almonds to put on top of the chocolate. Or why not try hazelnuts? For kid friendly biscotti, replace the amaretto with vanilla and cinnamon and then glaze them with white chocolate or icing with cinnamon and sugar sprinkled on it. Christmas time you could use crush Ghirardelli Peppermint Chocolate to use inside or drizzle on the outside and serve with Ghirardelli's famous Peppermint Hot Cocoa. I did not add real almonds to mine to keep mine kid friendly and my children love it. They rather enjoy learning about their Italian Culture through their taste buds.